Britain has some of the very best to offer when it comes to archaeological sites and how to photograph them never seems to be an issue, the situation takes care of itself. 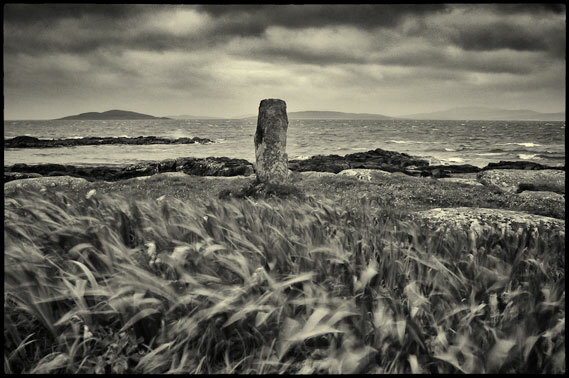 I try to be alone with the stones whenever possible and simply apply principles that are fundamental to photographing any situation; give yourself time, move around them enabling you to be within the moment rather than outside of it. Look at all possible ways of recording them and work out what it is that is drawing you in. It may be their relationship to the wider landscape, they way the light is falling upon them, their texture and form, the way the lichens are colonising them, their grandeur and presence. Whatever it is I feel I’m getting from them becomes the starting point of my work with them. During such moments I’ll not rush and I won’t start photographing immediately (unless some dramatic weather condition offers itself up). I’ll let myself be drawn into the event remembering that in the end I’m more than just a passive recorder of the site – a physical link to those who built and erected the stones and monuments. Photography, as I clearly see it, is not about manipulating an image, the philosophy that imbeds itself within my documentary work carries over into all other subject matter. Notwithstanding the fact that photography, by its very nature, is unreal and that we bring to it selection and construction of form, I try to hold on to a sense authenticity and accuracy within my work. Weather is important and light the key element within this area and although there will always remain the glorious unpredictability of what it will throw at you at any site and at any time. I try to plan visits to coincide with the conditions I would like to work with. On occasions I’ll aim for good visibility with sunshine and showers, at other times rain, mist, frost or snow. This often reflects my own state of mind at the time of planning the visit or I may want to complement work already carried out at the site. Within striking distance to home, I have the luxury and flexibility to work in this way, but at times I’ll be visiting sites in the north of Scotland or the outer Isles. On such visits I have to deal with what ever comes but you can always make it work. 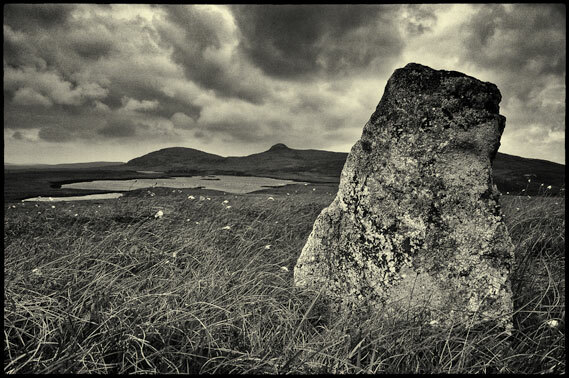 The stones have stood for millennia and in all conditions. I just have a very small moment with them in their own space and time and whatever the conditions, it still represents a ‘real’ moment in their existence. I’ll visit the same stones time and time again, always approaching them in a different way, often for what they give to me not what I take from them. I feel a tangible energy around such places, something I’ll explore in the a later essay. This essay was posted on November 18th, 2012.